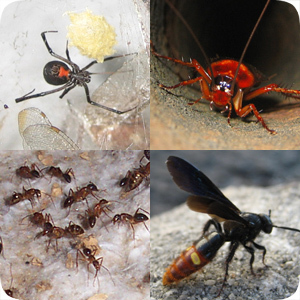 So you need pest control in Orlando Florida. This company only takes care of wild animal problems. If you have an insect problem and need an exterminator, I recommend that you call Gregg or a company from the yellow pages that deals with insect pest control in central FL. But if you have a problem with any mammal or reptile, give us a call! We are experts with rats. We also handle squirrels, raccoons, armadillos, bats, and all kinds of Florida pest animals. Click here for all problems with pests, or click any animal below. "tent the house" - that is, set a giant tent over the house and fumigate the entire thing with a poison that will kill all the termites. Or they might use a certain type of poison that takes advantage of colonizing insect structure - a type of poison that worker insects will bring into the colony and feed the queen, which will in turn destroy the whole colony. This is usually how ant control work, to the best of my understanding. When these companies try to deal with rodents, rats and mice specifically, they take the same sort of approach - they set out poison. Sometimes it's in feeding station boxes on the ground, sometimes it's in bars or packages or even liquid form, and placed in the attic or wherever the rodents are a problem. The poison approach may work well for insects, but as I discuss numerous times on my site, it's simply a horrible way to deal with rats. It never solves the problem (the exterminators don't want it to - they'll lose their monthly service fees) and it usually results in dead, stinking rats inside the attic or walls. The approach of a company like mine when it comes to rats is much better - its the same approach I use for all large animals - trap and remove all the animals, and permanently block off the holes that they use to enter the home. Easier said than done usually, but that's what I specialize in. Most of the public is ignorant of the field of wildlife control operators such as me, so when they search for someone to catch that raccoon in the attic or get that snake out of the pool, they often turn to the pest control companies. Such companies are usually not equipped to do large animals - so they either refuse or they attempt it, and don't solve the problem. The big bug companies like Terminix in Orlando or Orkin or Truly Nolen or Middleton, they don't want to bother with the squirrels running in your soffits. They want their technicians to spray as many lawns as possible with poison - get in, get money, and get out. These wildlife issues often take time and the willingness to work at unusual hours. Some jobs are simple, some are very difficult. Time on site could be ten minutes or five hours. The type of situation can vary tremendously, and requires a great deal of wildlife knowledge. Those noises in your attic could be rats running around, a group of opossums denning for the winter, a female raccoon with a litter of babies, a squirrel trying to build a nest, or a number of other possibilities. It's a specialty field. So when you have a problem with wildlife, don't think "exterminator" or "pest control company", think nuisance wildlife control operator.